The 76ers have existed this season in three iterations- before the Jimmy Butler trade, the period between the Butler and Tobias Harris deals, and the present. One characteristic that’s been consistent across each of these phases is the club’s knack for closing out close games, or to put it technically, “clutch” games. As defined by the NBA’s official statistical website, “clutch” games are those played at a five-point margin or less in the final five minutes or regulation. Prior to Butler’s arrival (from Oct. 16 - Nov. 12), the Sixers were 6-2 in such contests. After acquiring the four-time All-Star and before landing Harris (Nov. 14 - Feb. 5), the squad went 13-7. Since obtaining Harris, the Sixers have gone 10-3 in “clutch” games, with the last five victories of a season-long six-game win streak all falling under this category. For the entire 2018-19 campaign on the whole, no franchise has done better than the Sixers in “clutch” games. They pace the league with a 29 “clutch” wins overall, while having played the second-most “clutch” games, at 41. The same night as the Sixers’ 118-115 triumph over the Boston Celtics, Brown said he felt a “little bit of luck” has factored into his group’s success in “clutch” games. But he also pointed to an increasing sense of comfort among his top players. In particular, Jimmy Butler has come up huge. He’s tallied 16 total “clutch” points in the Sixers’ past five outings. Specifically, there was Butler’s timely insurance lay-up and tie-breaking 3-pointer last Tuesday at Charlotte. 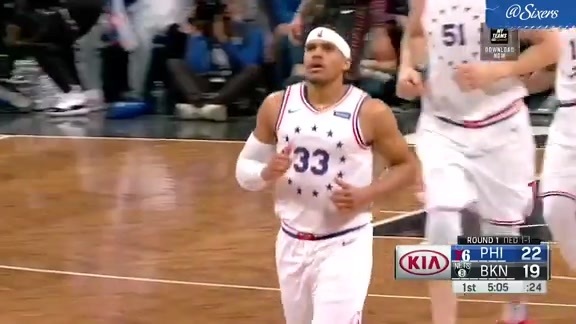 Then, he hit the signature, pose-striking baseline jumper with 5.5 seconds to go Wednesday that all but assured the Sixers would beat Boston. Butler was brought here to deliver in high-stakes, pressure-packed moments, and down the season’s home stretch, he hasn’t disappointed. With the postseason set to start in three weeks, the Sixers’ extensive exposure to tight, tense, late-game scenarios only figures to help. That they’ve wound up on the winning side more than 70 percent of the time could bode even better. “We’re going to need all that - and some - as big games or playoff games happen where you’re able to close those things out and execute well,” said Brown. This has indeed been the name of the Sixers’ game, regardless of who or which version of the team they’ve rolled out there.